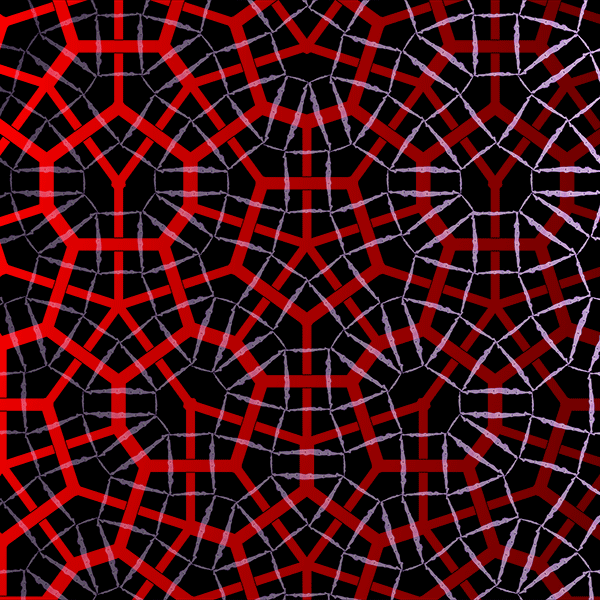 Dark geo is a Penrose-wallpaper. It represents two infinite and aperiodic networks. The networks based on each other, but they are can not bee seen together. One of them visible in normal light, the other one lights up in the darkness, by ultraviolet light. At the border of the two kind of light, where the visible light and the lightning of the ultraviolet light have same intensity the two networks are connected. The visible network is red and geometric, the invisible network composed from human figures. The installation divides the exhibition space into two parts. There is a red and an ultraviolat section. The networks can be seen from each side. Before asking: Dark geo II was made, because Dark geo's ultraviolet part was very weak. Clockwork III. Dark geo I.